Sisters follows the story of Julia Bechly whose life is turned upside down when her father, in vitro fertilisation pioneer Julius Bechly, makes a death-bed confession that during his award-winning career as a fertility specialist he used his own sperm and admits he could potentially be the father of hundreds of children. Julia decides to make the most of the situation and throws a family gathering where she finds out she has hundreds of brothers, but learns she only has two sisters, troubled children’s television star, Roxy Karibas and belligerent lawyer, Edie Flanagan. Julia Bechly is living life as usual caring for her sick father, Julius, until a news story reports that Julius had used his own sperm during the time he was a fertility specialist, she asks her father if it’s the truth which he confirms. Although panicked, Julia decides to throw a “family gathering” to meet all her biological siblings, at which she finds out she has many many brothers but only two female siblings, troubled children’s television star, Roxy Karibas and belligerent lawyer, Edie Flanagan. Note: This episode has an extended run time of 75 minutes. In February 2019, U.S. network Fox Network had ordered a pilot to be filmed. Creater/producer Imogen Banks will executive produce the series as will Annie Weisman, Jeni Mulein, Sharon Levy & Jason Katims, Leslye Headland will direct the pilot. Universal Television will produce in association with Endemol Shine North America. In February 2019, actress Brittany Snow was cast in the main role as Julia Bechley. In March 2019, Timothy Hutton was cast to play Julia’s father, Leon Bechley, along with Megalyn Echikunwok and Emily Osment who will play the unknown sisters of Julia. ^ Knox, David (4 November 2016). "2017 Upfronts: TEN highlights". tvtonight.com.au. Retrieved 9 October 2017. ^ a b c d e f g h DeBolt, Virginia (6 Sep 2018). "Review: Sisters". oldaintdead.com. Old Ain't Dead. Retrieved 12 Jan 2019. 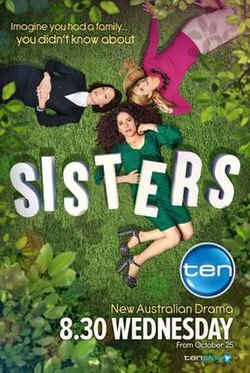 ^ "Sisters: episode guide". australiantelevision.net. Retrieved 29 October 2017. ^ a b Knox, David (25 October 2017). "Wednesday 25 October 2017". tvtonight.com.au. Retrieved 26 October 2017. ^ a b Knox, David (2 November 2017). "ABC beats commercial offerings". tvtonight.com.au. Retrieved 2 November 2017. ^ a b Knox, David (9 November 2017). "Gruen, Hard Quiz, Rosehaven, 7:30 all win Wednesday slots". tvtonight.com.au. Retrieved 9 November 2017. ^ a b Knox, David (16 November 2017). "Socceroos score on Wednesday". tvtonight.com.au. Retrieved 16 November 2017. ^ Knox, David (23 November 2017). "Local drama doing it tough on Wednesday". tvtonight.com.au. Retrieved 23 November 2017. ^ Knox, David (30 November 2017). "Ratings quirks on a quiet Wednesday". tvtonight.com.au. Retrieved 30 November 2017. ^ Knox, David (4 November 2017). "Timeshifted: Wednesday 25 October 2017". tvtonight.com.au. Retrieved 4 November 2017. ^ Knox, David (19 November 2017). "Timeshifted: Wednesday 1 November 2017". tvtonight.com.au. Retrieved 19 November 2017. ^ Otterson, Joe (13 February 2019). "Fox Orders Drama Pilot From Annie Weisman, Jason Katims". variety.com. Retrieved 21 February 2019. ^ Knox, David (21 February 2019). "Sisters adaptation proceeding to pilot in USA". tvtonight.com.au. Retrieved 21 February 2019.